The Beta Kappa Alumni Chapter of Sigma Nu will be hosting a reunion weekend in Manhattan, September 18th and 19th. To attend the breakfast and Alumni chapter meeting, please RSVP no later than August 28th at Beta Kappa Alumni Weekend RSVP. Please join us for an informal gathering at The Tap House, in downtown Manhattan, beginning at approximately 7pm. 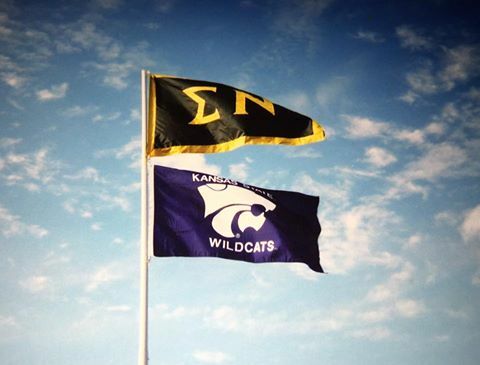 The Alumni Chapter will host a breakfast from 9am to 10am at the Kansas State Leadership studies building. Spouses and children are welcome to attend the breakfast. Breakfast will be $10 per person, just to cover our cost of food. The best place to park would be Waters Hall or lots O, T, and W. The Leadership Studies building is located at the corner of Mid-Campus Drive and Old Claflin Rd. Click on this campus map for additional context. Our Annual Alumni meeting will follow breakfast from 10am to noon. We would ask that attendees please bring a check for $50 ($25 if you have only been out of school for two years or less), for Annual Alumni Chapter dues. Checks can be made out to Beta Kappa Alumni Sigma Nu Fraternity. At the meeting, we will explain how these funds are being used, such as the cost of using the Leadership Studies building to host our meeting. These dues represent a necessary minimum annual contribution, in order to fund the basics for an Alumni chapter, in our mission to bring back Beta Kappa to Kansas State! When you factor in Family Weekend and Band day for this game, hotels are bit scarce. If you have a hard time locating a room in Manhattan, you might try Junction City, airbnb.com, vrbo.com or check for cancellations. As of this communication, Super 8 confirmed that they still have rooms. We are not able to secure a block of tickets, due to high demand for season tickets combined with Family Weekend, but there are tickets available out on web sites, such as Vividseats.com, Stub Hub, Craig’s List etc. Please feel free to contact [email protected] if you have any questions. We look forward to seeing you September 18th and 19th!